Carnitine membrane transporter deficiency or primary carnitine deficiency (PCD) is an autosomal recessive disorder of fatty acid oxidation, in which the transport of carnitine into cells is impaired. Carnitine plays an important role in transporting fatty acids into the mitochondria and carnitine deficiency block oxidation of long-chain fatty acids in the mitochondria that leads to heart and hepatic disease, myopathy, nonketotic hypoglycemia, and neurological complications. PCD has a wide range of symptoms and can reveal itself as symptomatic cardiomyopathy or even asymptomatic. In this study, we reported twin brothers with PCD. One of them had symptoms of disease and cardiomyopathy and was under treatment with carnitine. Another twin was asymptomatic and was diagnosed during follow-up period of his brother. The disease is created by mutation hemozygot or compound heterozygot in SCL22A5 gene (on chromosome 5). This mutation leads to a dysfunction of OCTN2 protein. This mutation causes reduction in serum carnitine level and increase in intracellular creatinine and and its urinary excretion. Carnitine is an essential cofactor for fatty acid metabolism and has an important role in transporting fatty acids into the mitochondria. Long-chain fatty acids are important energy substrates for the myocardium and other muscles. Deficiency of carnitine blocks the mitochondrial oxidation of fatty acids. Since skeletal and particularly cardiac muscle depend on fatty acid oxidation for most of their energy, these tissues are severely affected by carnitine deficiency. Thus, carnitine deficiency leads to heart and hepatic disease, myopathy, nonketotic hypoglycemia, and neurological complications. The clinical diagnosis criteria of PCD are as follows; (1) severe reduction of plasma or tissue carnitine levels (free carnitine <5 mM, controls 25–50 mM), (2) evidence of impair fatty acid oxidation, (3) improvement of disease signs and symptoms by carnitine supplementation, (4) absence of other primary defects in fatty acid oxidation. Clinical diagnosis of the disease could be confirmed by demonstrating reduced carnitine transport in skin fibroblasts of the patient or by mutation analyses of the SLC22A5 gene. The prognosis depends on the age, presentation, and severity of symptoms at the time of diagnosis. Early detection of these disorders before the occurrence of irreversible organ damage may lead to more effective treatment and more favorable outcomes. In this study, we reported twin brothers with carnitine membrane transporter deficiency with different manifestations of the disease in Isfahan, Iran. A 6-year-old boy was admitted to the Pediatric Clinic of Imam Hussein Hospital, the referral hospital for pediatric disease in Isfahan, for the evaluation of his chronic abdominal pain and frequent vomiting. Abdominal pain was initiated 3 months before admission and did not respond properly to outpatient medical treatment. In familial and past medical history, he was the second child of the family, a twin pregnancy born by cesarean section. Parents were second cousins. Mother and father were both healthy. They did not have a family background for certain disease. The patient had no history of any disease. The patient was examined clinically by a pediatrician. The patient had normal development. Weight and height of the patient were 17 kg (below 5% percentile) and 113 cm (between 10% and 25% percentile), respectively. His systolic and diastolic blood pressures were 65 and 40 mmHg, respectively. He had fast and deep respiration (respiratory rate = 60). A heart systolic murmur (II/VI) was heard. Liver span was 13 cm. Physical examination of other organs was normal. Level of serum glucose, electrolytes, and thyroid function was in normal range. Renal function test and complete blood count were normal. Spot urine for ketones was negative. Other laboratory findings and their normal range are summarized in [Table 1]. The patient had metabolic acidosis. Cardiomegaly was observed on chest X-ray. In echocardiography, dilated cardiomyopathy along with ejection fraction of 36% and mitral and tricuspid valves regurgitation were reported. In the electrocardiogram (ECG), tall peaked T-wave and short QT interval were seen [Figure 1]. To determine the underlying cause of cardiomyopathy, metabolic evaluation was carried out for the patient. This test was done by Spectrometry Tendem Mass Technique (Wagner Stibbe Laboratory, Hannover, Germany). Serum total carnitine was 24.11 μmol/L (normal range: 33.8–77.5). Based on the above results, carnitine transporter deficiency was strongly proposed for the patient. The patient underwent treatment with oral levocarnitine (100 mg/kg/day) in three doses. Within a few weeks, there was a dramatic resolution of heart failure. After 1 year treatment, the patient's ejection fraction rate improved (from 36% to 50–55%) and heart size decreased. As the patient had a twin brother and they were homozygote twins, his brother was evaluated also. His brother did not have any symptom. He had normal development. He was examined clinically and had no abnormal findings. His weight and height were 18 kg (between 5% and 10% percentile) and 113 cm (between 10% and 25% percentile), respectively. All laboratory measurements were in normal range. Serum total carnitine was 26.8 μmol/L (normal range: 33.8–77.5). According to the above results, carnitine transporter deficiency was also proposed for this patient. He also underwent treatment with levocarnitine. A few months after treatment with carnitine, the findings of echocardiography showed significant improvements. It should be noted that a specific disease in these homozygote twin brothers is presented in two different forms (one symptomatic and another one asymptomatic). In this report, we presented two homozygote twin brothers with PCD and different manifestations of the disease. One presented by cardiomyopathy and the other was asymptomatic and was diagnosed during follow-up evaluation of his brother. Deficiency in carnitine transport from the plasma membrane (PCD) is a condition, in which the body cannot use the fat for energy production, especially in conditions such as illness or fasting. Incidence of the disease has a great variability in different regions and different ethnic population. It was reported to be 1/40,000 in Japan and 1/1300 in Island., There was no report regarding its incidence in Iran. Stanley et al. have reported the clinical presentation of 15 infants and children with abnormal carnitine uptake. Mean age of studied patients was 3 years, and the most common symptom of PCD was progressive cardiomyopathy. Other symptoms were weakness or acute coma and episodes of fasting hypoglycemia. Episodes of hypoglycemia were presented during the first 2 years of life and before the occurrence of cardiomyopathy. Shibbani et al. have reported the characteristics of eight Lebanese patients with PCD from five different families. The most common symptoms were cardiac manifestations. Seven patients between 8 months of age and 10 years of age had heart failure. Forty-two percent of patients had cardiac symptoms and 63% of them had cardiac symptoms along with other symptoms. In this study, the first case had cardiomyopathy and another one had asymptomatic cardiomyopathy. There are some similar studies which reported different presentations of PCD among children of a family. Mutlu-Albayrak et al. in Turkey have reported a case of 9-year-old boy with PCD which presented by dysmorphic face and hypertrophic cardiomyopathy. In his familial history, he had a sister who died at 19 months because of sudden death. During follow-up and family evaluation, his 4-year-old sister who was suffering from fatigue was evaluated, the hypertrophic cardiomyopathy was detected, and the diagnosis of PCD was confirmed for her also. He was from a family with parental consanguinity. His carnitine level was 0.92 μmol/L. ECG data showed cardiomyopathy pattern, and in echocardiography, concentric hypertrophy of the left ventricular with an ejection fraction of 82% was observed. In either cases, treatment by carnitine led to improvement in the symptoms and carnitine level increased for both patients. In another case report from Italy, two boys from different families with PCD were introduced. Both of them had myopathy, one with and another without cardiomyopathy. The case with no cardiomyopathy had also episodes of hypoglycemia, and in his family evaluation, his brother died during early life. Autopsy findings of his brother showed dilated cardiomyopathy and low level of cardiac carnitine. They concluded that PCD could be expressed with different phenotypes in a family and also among different families, especially in its autosomal recessive form. As mentioned, PCD is the one of the most important preventable causes of cardiomyopathy, and its proper management would prevent or reduce the progression of cardiomyopathy in affected patients. In a study, twenty children with PCD were evaluated. The most common symptom was progressive cardiomyopathy (12 patients), the average age of cardiomyopathy was 2–4 years of age, and cardiac disorder in these patients has not responded to inotrope drug and diuretics, but treatment with carnitine in these patients responded well and prevented heart failure. In our case, similarly, cardiomyopathy significantly improved 1 year after the treatment with carnitine. 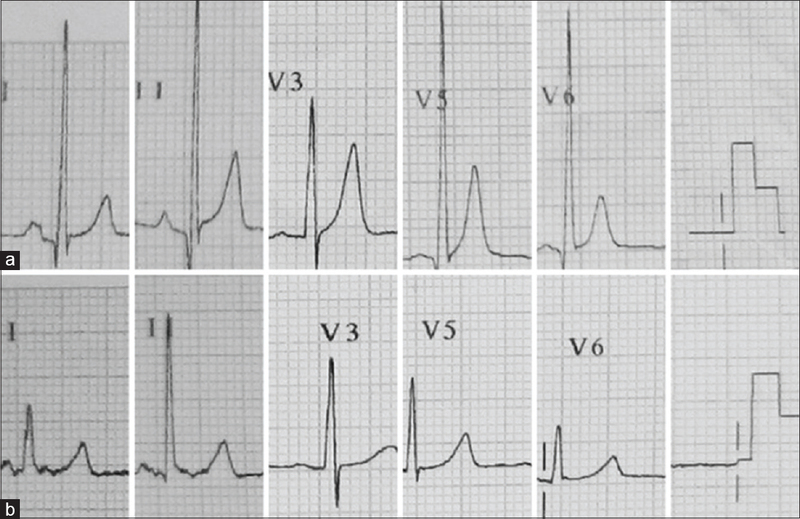 ECG presentations of PCD were first described by Tripp et al. in 1981. They reported a bizarre T-wave enlargement in midprecordial leads of girls with PCD, similar to the ones observed in the extensive posterior wall ischemia or hyperkalemia. Thereafter, other studies also reported similar findings in patients with PCD., In addition, Waber et al. have showed that the ECG presentations will be reverted to normal after L-carnitine administration. Similarly, Tein et al. have indicated that in three of four patients with PCD and cardiomyopathy who had mentioned ECG changes, the presentations disappeared after the treatment of the patients with L-carnitine. Another study from Korea showed similar results. Our findings in the ECG of the patient were similar to that reported in previous studies, and the findings revert to normal after treatment with carnitine. Lamhonwah et al. have introduced a case of Saudi girl with PCD due to R254X mutation in the OCTN2 gene. The girl was hospitalized at 6 months of age due to recurrent infections, dilated heart, hypotonia, and motor delay. In laboratory findings, fatty acid oxidation disorder and reduction in carnitine uptake from skin fibroblasts were observed, and the patient was orally treated by carnitine. This treatment improved heart function, muscles tone, and exercise tolerance, and at the age of 3 years, she was quite normal. As we can see, in this study, the same as in our case, patients had dilated cardiomyopathy, a common symptom seen in patients with carnitine transporter disorder. Immediate diagnosis and treatment of these patients were successful similar to our case. Carnitine transporter deficiency manifests with different clinical symptoms. Although cardiomyopathy is the most common symptom, they can be even asymptomatic in patients with primary carnitine disorder. Since the disease is autosomal recessive, checking family members regarding the presence of a disorder is important. Early diagnosis and treatment of patients with PCD prevent heart failure and sudden death. Evidences indicated that proper and long-term therapy with carnitine could increase its level up to 10% of its normal level and those who stopped treatment, faced sudden death in the second and third decades, and this shows that treatment of PCD should be continued. Thus, long-term treatment with carnitine and avoiding starvation and fasting and long and heavy exercises are required. On follow-up of these patients, checking carnitine levels, ECG, and regular echocardiogram are reasonable. The prognosis depends on the age, presentation, and severity of symptoms, at the time of diagnosis. Early detection of these disorders before the occurrence of irreversible organ damage may lead to more effective treatment and more favorable outcomes. Alaee MR. Carnitine transporter deficiency. Iran J Child Neurol 2013;7 (4) Suppl 1:14. Rasmussen J, Nielsen OW, Janzen N, Duno M, Gislason H, Køber L, et al. Carnitine levels in 26,462 individuals from the nationwide screening program for primary carnitine deficiency in the Faroe Islands. J Inherit Metab Dis 2014;37:215-22. Fu L, Huang M, Chen S. Primary carnitine deficiency and cardiomyopathy. Korean Circ J 2013;43:785-92. Shibbani K, Fahed AC, Al-Shaar L, Arabi M, Nemer G, Bitar F, et al. Primary carnitine deficiency: Novel mutations and insights into the cardiac phenotype. Clin Genet 2014;85:127-37. Fu LJ, Chen SB, Han LS, Guo Y, Zhao PJ, Zhu M, et al. Clinical presentation and therapeutic outcomes of carnitine deficiency-induced cardiomyopathy. Zhonghua Er Ke Za Zhi 2012;50:929-34. De Biase I, Champaigne NL, Schroer R, Pollard LM, Longo N, Wood T. Primary carnitine deficiency presents atypically with long QT syndrome: A case report. JIMD Rep 2012;2:87-90. Labarthe F, Benoist JF, Peralta M. Primary carnitine uptake deficiency is associated with short QT syndrome and ventricular fibrillation. 11th International Congress of Inborn errors of Metabolism, San Diego CA. Mol Genet Metab. 2009;98:55-6. Longo N, Amat di San Filippo C, Pasquali M. Disorders of carnitine transport and the carnitine cycle. Am J Med Genet C Semin Med Genet 2006;142C: 77-85. Magoulas PL, El-Hattab AW. Systemic primary carnitine deficiency: An overview of clinical manifestations, diagnosis, and management. Orphanet J Rare Dis 2012;7:68. Fatty Acid Oxidation Disorder. STAR-G, Screening, Technology and Research in Genetics; Available from: http://www.newbornscreening.info. [Last accessed on 2016 Feb 07]. Limketkai BN, Zucker SD. Hyperammonemic encephalopathy caused by carnitine deficiency. J Gen Intern Med 2008;23:210-3. Yang LL, Haung XW, Byang J, Zhou XL, Haung XL, Yang RL. Screening and diagnosis of children with primary carnitine deficiency in Zhejiang province China. HK J Paediatr (NewSer) 2013;18:167-73. Stanley CA, DeLeeuw S, Coates PM, Vianey-Liaud C, Divry P, Bonnefont JP, et al. Chronic cardiomyopathy and weakness or acute coma in children with a defect in carnitine uptake. Ann Neurol 1991;30:709-16. Mutlu-Albayrak H, Bene J, Oflaz MB, Tanyalçin T, Çaksen H, Melegh B. Identification of SLC22A5 gene mutation in a family with carnitine uptake defect. Case Rep Genet 2015;2015:259627. Garavaglia B, Uziel G, Dworzak F, Carrara F, DiDonato S. Primary carnitine deficiency: Heterozygote and intrafamilial phenotypic variation. Neurology 1991;41:1691-3. Tripp ME, Katcher ML, Peters HA, Gilbert EF, Arya S, Hodach RJ, et al. Systemic carnitine deficiency presenting as familial endocardial fibroelastosis: A treatable cardiomyopathy. N Engl J Med 1981;305:385-90. Matsuishi T, Hirata K, Terasawa K, Kato H, Yoshino M, Ohtaki E, et al. Successful carnitine treatment in two siblings having lipid storage myopathy with hypertrophic cardiomyopathy. Neuropediatrics 1985;16:6-12. Waber LJ, Valle D, Neill C, DiMauro S, Shug A. Carnitine deficiency presenting as familial cardiomyopathy: A treatable defect in carnitine transport. J Pediatr 1982;101:700-5. Tein I, De Vivo DC, Bierman F, Pulver P, De Meirleir LJ, Cvitanovic-Sojat L, et al. Impaired skin fibroblast carnitine uptake in primary systemic carnitine deficiency manifested by childhood carnitine-responsive cardiomyopathy. Pediatr Res 1990;28:247-55. Lamhonwah AM, Onizuka R, Olpin SE, Muntoni F, Tein I. OCTN2 mutation (R254X) found in Saudi Arabian kindred: Recurrent mutation or ancient founder mutation? J Inherit Metab Dis 2004;27:473-6.